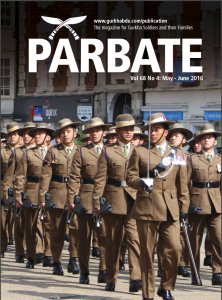 Dear all Gurkha Brigade Association friends, please find below the link to all online version of Parbate. QGS Freedom of Blandford parade. 2 RGR in full swing in Kabul, Afghanistan. Interview with DCOS Maj Surya Rai on the growth of the Brigade of Gurkhas. Mark Lancaster TD MP visits HQ Brigade of Gurkhas. We hope you enjoy the accompanying music! Click on the picture above to read the May-June 2016 edition of Parbate.